The BDH2000FL Flex Vac handheld vacuum is easily the most versatile model in Black & Decker’s Platinum range. Just like the rest of the Platinum range, the Flex Vac incorporates a Max Lithium-Ion battery that is combined with Smart Charge technology, which results in impressive charge and run times. 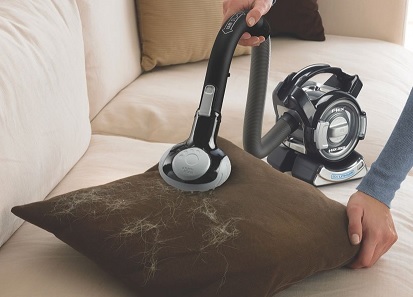 Aside from the impressive performance in power and battery life, it hosts a range of useful attachments such as a flexible hose and pet hair removal tool, which makes the Flex Vac standalone from the rest of the Platinum range. Users have found the Black & Decker Platinum Flex BDH2000FL to provide more use than other handheld vacuums, a large reason for its niche popularity. Long Lasting Battery: Incorporates a long-life Lithium Ion technology, which allows the battery to hold a charge for up to 18 months with no memory effect, which provides a longer lifespan for the battery. Charges Quickly & Saves Energy: The Lithium Ion battery not only charges up to 6 times faster than other batteries, but it also uses 25% less energy, saving you money on your energy bills. Only Charges When Necessary: It uses a Smart Charge Technology where the battery only charges when it needs to, which means you can leave it on its charging base for however long you like. Long Run Time: The Lithium Ion battery provides a good run time. 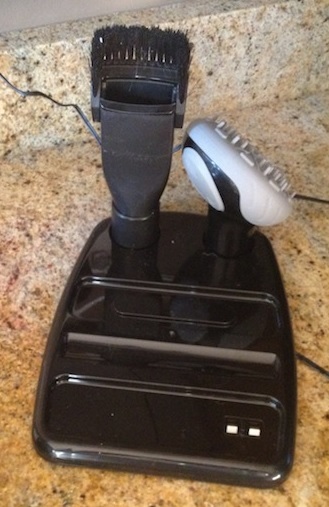 Users have been getting around 15-25 minutes, which is very impressive for a powerful handheld vacuum. Consistently Strong Suction Power: The high performance motor combined with its Cyclonic Action Technology ensures suction power remains strong throughout use. Easily Reach Confined Areas: The 4 inch flexible hose with an attachable brush and crevice tool comes in handy as it allows you to get into nooks and crannies, which makes it great for cleaning car interior also. Great For Cleaning Pet Hair: Includes a pet hair tool which features a rubber surface, making it effective at getting rid of stubborn pet hair. Easy Charging & Storage: Comes with a charging base that also acts as a storage caddy where you can keep all the accessories. The people that know best about the product are those who have actually purchased and tested it out over a period of time. We have researched over 70 positive and negative user reviews on Amazon to provide you with a general consensus of their experiences with the Black & Decker Platinum BDH2000FL. Most users generally agree that the suction power for the BDH2000FL is good for a cordless handled vacuum. It’s strong enough to pick up light objects such as crumbs, kitty litter, bits of mud, skittles etc. So ideally, it will be used for quick spot cleans rather than full cleaning jobs. It has been pointed out that at 22 air watts, it’s 37% less than Black & Decker’s other less expensive models PHV1810 and 12% less than the original model FHV1200. With that being said, it appears that Black & Decker sacrificed more suction power for better run times. 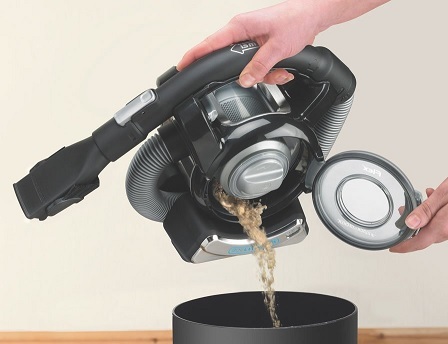 Plus, the BDH2000FL provides consistent suction power with no signs of weakening during cleaning. Long lasting battery & consistent suction power. The most outstanding aspect for users is the battery performance, which averages around 18 minutes of continuous running time, and between 1.5-2 hours of semi-continuous cleaning. Black & Decker even says that run time may increase after a minimum of 5 full charges. This could be true since some users manage to get up to 25 minutes of continuous use. Unfortunately, its Max Lithium-Ion battery (20V) cannot be removed to be replaced, so when it eventually dies, it renders the entire device useless. The good news is that the quality of the battery ensures that it will last at least several years before giving up. The battery has no memory effect meaning that it will always hold its charge no matter how long the device remains inactive for. It also incorporates a Smart Charge technology so you won’t have to worry about taking the device off charge, as it automatically stops charging when it reaches a full charge. All of these features end up helping to increase battery life and its performance. Some users are surprised at how small the BDH2000FL is, as it looks bigger in images. Not only is it small, but weighing in at 3.8lbs, it’s lighter than many handheld vacuums. Weight is evenly distributed so it doesn’t feel as though one area is heavier than the other. When lifting the device and using the hose, both hands must be used, but the main body can be placed on a surface with the hosed being used independently. Just be careful not to place it on a high platform as it can slide off when the hose is tugged. Most users love the high quality flexible stretch hose. The other main selling point of the BDH2000FL is it’s stretch hose. The majority of users have praised the usefulness of this attachment. Made from a combination of rubber and plastic, it’s very light and feels high quality (many other hosed vacuums are made from cheaper polyethylene material). It can be stretched to around 4 feet long, with the end of the hose giving a straight-line reach of around 10 inches. The combination of attachments that lock onto the end of the hose allows you to get into different sized nooks and crannies, as well as providing extra length for a further reach. One user stands at 5’7 and said that she can easily use the hose and an attachment to reach an 8 foot ceiling without stretching. Attachments from other Black & Decker models (and other vacuums too) are able to fit this hose also, but they will not lock into place. Handy but cannot be wall-mounted. The crevice tool is around 7 inches (which gives a total end reach of 17” when attached to the hose) with the thin tip measuring at 0.5” x 1.1”. The nozzle tool has a wider mouth and the brush flips upwards from under and adds an extra couple inches to the nozzle. Users have found the brush effective for dusting surfaces but not for scrubbing. There have also been complaints that not enough suction reaches the tip of the brush, since the bristles only cover 3 sides and leaves an opening at the bottom for air to escape. It perhaps would have been better if the bristles were shorter or covered all four sides. Although it’s slightly odd looking, the pet hair tool has proven to be very effective at removing hair from carpets and upholstery. It has a rubber surface with various shaped wedges and points that cover a large area. Whenever it’s time to charge the vacuum, it’s placed on top of the charging dock which must be on a flat even surface to charge. The charging light was described as being bright enough to light up a small room. If you find this a nuisance, then it helps to stick a bit of tape over it. The dock is quite large with the base being around 9” x 7” and unfortunately, it cannot be wall mounted which is a bit disappointing. However, the wall mount for similar model FHV1200 can hold it but it doesn’t charge the device. The dock also holds two attachments, with the third presumably intended to remain on the hose itself. The dirt container holds around 0.5 liters of waste, which is quite good compared to most other handheld vacuums. The cover is also semi-transparent so that you can see when it’s time to empty the bin. However, because the container cannot be removed, it has to be emptied by opening the cover and tipping it on its side, something that many users find a bit awkward. Also, the filter is located directly in the center of the dirt container, which means when you do empty it, dirt and dust pours out from the top, bottom and sides. This can get messy if you don’t pinpoint it directly over a bin. The washable filter is the same as the FHV1200 (replacement filters FVF1200). has been praised as being good quality and should last long, just as long as it’s well taken care of (cleaned occasionally) and the filter refresh knob helps to flick dust off. It can be cleaned in a dishwasher, but must always be completely dry before using again. A solid housing with high quality components such as the Lithium-Ion battery will equate to a long lifespan. The Platinum BDH2000FL is a well thought out design, proven by having the motor located within the filter housing, a feat of great engineering. The manufacturer fault levels are so miniscule, that we believe that it’s fair to make the assessment that the device will outlast it’s 3 year warranty by at least another couple years. 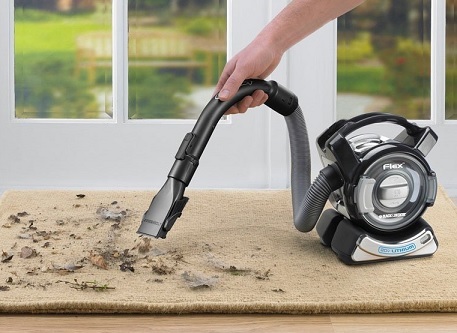 Of course, the main question that consumers have with a premium handheld vacuum is if the product justifies the price. The Platinum BDH2000FL is not cheap, but nowhere near as expensive as a Dyson. Some users feel that the price point is reasonable while others think that it’s $10-15 too much. However, there are always promotional deals on this product so you may want to check the live price on Amazon. The Black & Decker Platinum BDH2000FL is one of the highest rated handheld vacuums in B&D’s Platinum range. Watch a demonstration of the BDH2000FL below. We’re well aware that it’s an advertisement but it does exactly what it states in the video. Lightweight, solid build and high quality components. Slightly awkward way of emptying the dirt container. A versatile handheld vacuum with a quality hose and crevice tool that can do an effective cleaning job around the home, in a car and for pet hair. Not the most powerful handheld vacuum but has impressive (better than most) charging and run times. The Black & Decker Platinum BDH2000FL Flex is a well-engineered premium device that demands a matching price tag. While some feel that it may be a bit too expensive for what it is, it must be said that it’s able to perform many cleaning tasks effortlessly and will most likely outlast most other handheld vacuums. 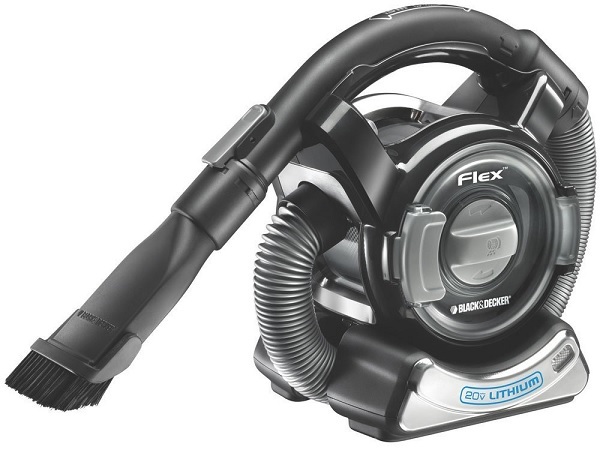 Check The Current Prices For The Black & Decker Platinum Flex BDH2000FL Now!